Engevita nutritional yeast is deactivated yeast (not to be confused with brewer’s yeast) that is rich in protein and B vitamins, as well as amino acids, minerals and enzymes. That makes it great for vegetarians and vegans alike, although many others choose to also use it as an alternative to salt. Some use it instead of parmesan cheese to sprinkle in cooking or as a condiment as it has a cheese-like flavour. The ways to use it are endless and various – dissolved in water or juice, sprinkled on soups and stews, added to mashed potato or scrambled egg….find your way in your own time and enjoy. To preserve valuable vitamins it is advisable not to heat to 100C. The Engevita - Nutritional Yeast Flakes - 125g product ethics are indicated below. To learn more about these product ethics and to see related products, follow the links below. Vital part of my vegan diet - gives a lovely savoury flavour to many dishes. Good price too. 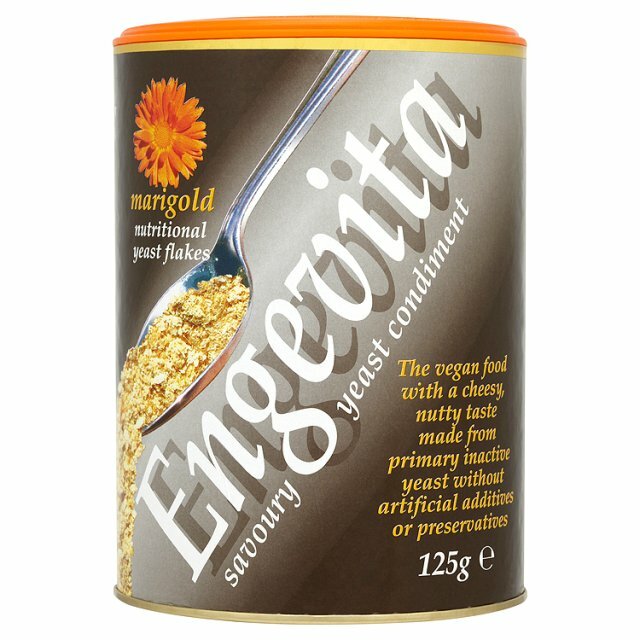 There are currently no questions to display about Engevita - Nutritional Yeast Flakes - 125g.